Our advertisement ran again Monday, March 14 (following its first appearance March 7) in the National Weekly Edition of the Washington Times. We are receiving very positive feedback from the ad, including some substantial contributions. We are grateful to Dr. Mark Klein for his generous support, which enabled us to run these initial ads (full version of the ad  375kB JPEG file; 7.75" x 9.7" at 150 dpi resolution). Your response to these ads has enabled us to run a second, more ambitious ad. Our next ad will appear Monday, March 28 and Monday, April 4. It will include endorsements from some of the most prominent leaders and advocacy groups here in Washington and around the nation. These are voices which the politicians and media cannot ignore. We are planning more ads in the Times and, with your support, other newspapers as well. In recent months, we have spoken at many high-level briefings of decision-makers here in Washington. We discussed the advertisements and garnered endorsements, and we discussed federal legislative measures to reverse the destruction of families and the creation of a coalition of sympathetic organizations and leaders. For this to continue, we need your help. Our effectiveness in Washington is directly proportional to the amount of grassroots support we can claim throughout the country. We need support from all our members and from parents who are not yet ACFC members. 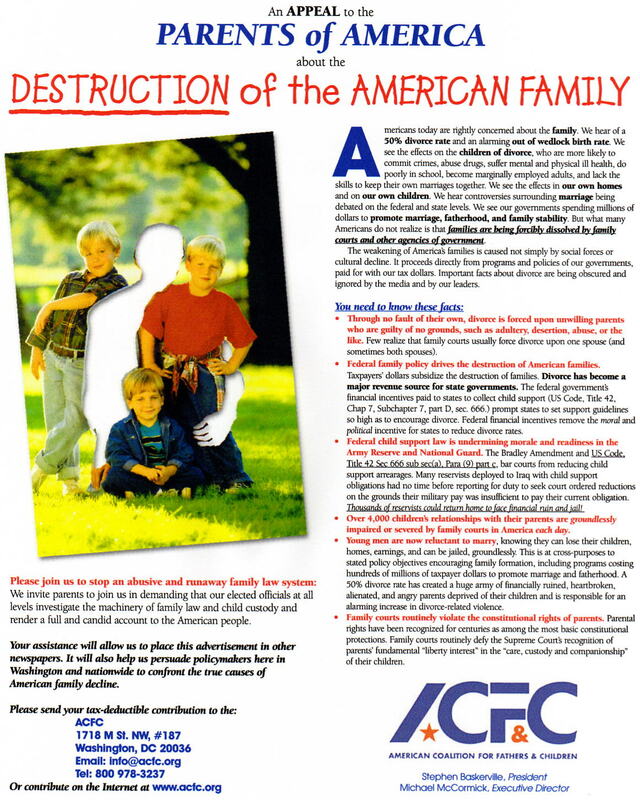 Your contribution (click here) will enable us to run more ads and to undertake other initiatives here in Washington to advance the cause of family law reform. We must have the capacity to work on these issues full time. For this to happen we need to increase our funding. We are approaching major donors. Yet the bulk of our funding must come from membership -- from you. A large membership base also increases our clout on Capitol Hill. Please join or renew your membership in ACFC. Please make a larger contribution to ACFC, in the amount of $100, $250, $500, or more. Urge friends and family members to join. (Forward this email to everyone you know, and attach a copy of the ad.) Urge your attorney to join as a show of commitment to the principle of equal justice. Join your local ACFC affiliate or other group. If it is not yet an ACFC affiliate, make it one. The paperwork is very simple. ACFC and your group will grow together. Contact your local newspapers and television and radio stations and politicians. Tell them your story (briefly). Tell them about your local group. Say they are affiliated to ACFC. Get others in the group to do the same. Then do it again. And again. Be respectful but persistent. Eventually they will listen. Stay connected with ACFC through our new journal, The Liberator and through our email list-serve for information about national developments, local groups and their activities, and coordinate your work with others. After the appearance of the ads next week we will send suggestions of how to use the ads in your local campaigns. More soon.